Trish Maguire, secure in her job as a top corporate lawyer, has almost forgotten the harshness of her early career defending abused children. But when Sam Foundling, her first client, comes back into her life as an adult, she's forced to revisit those painful times. Now a brilliant sculptor, married to Trish's colleague Cecilia and expecting his first child, Sam seems toTrish Maguire, secure in her job as a top corporate lawyer, has almost forgotten the harshness of her early career defending abused children. But when Sam Foundling, her first client, comes back into her life as an adult, she's forced to revisit those painful times. Now a brilliant sculptor, married to Trish's colleague Cecilia and expecting his first child, Sam seems to have gotten over the abuse he suffered as an adolescent. When Cecilia is found beaten to death in Sam's art studio, the police, including Trish's best friend Caroline, are sure that Sam is to blame. Trish, however, is not so quick to believe it. Is Sam merely a distraught husband, trying to hold it together for his newborn daughter, or was the horror of his past too much for him to overcome? Or did Cecilia's murder have something to do with the seemingly cursed London Arrow building, built on the mass grave of plague victims? 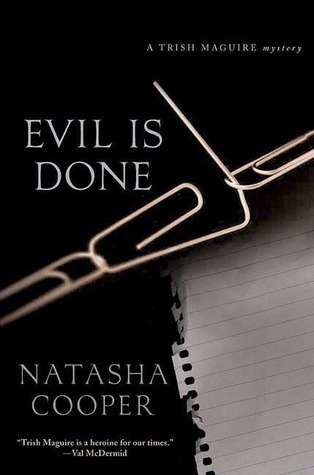 In her eighth Trish Maguire mystery, Natasha Cooper shows all the emotional intelligence, strong characterization, and sense of place that have won her acclaim from both readers and critics. I'm aware that the author is an integral part of British mystery circles. I feel bad giving the book such a low rating. I couldn't help it. It wasn't the plot so much as the characters--especially what they think. In short, most drove me crazy--including Trish. I'll leave others to discover how they react. I'm going to try not to meet Trish again. This book is hard to read for me. It is set in London and written by a British author. It centers around the Britsh legal scene, which I know nothing about. It uses terms and slang that I don't understand. However, it is a good basic story. Love this series of English mysteries! The book was great and well written. It dragged a bit but all in all it was well done. Somewhat needlessly divided between different points of view but a relatively good read for the train. 3 1/2. Well-drawn protagonist and an interesting plot. I liked this series a lot.